This week’s surprising inspection discoveries were not spotted during an official home inspection. These photos of roof damage were taken in neighborhoods where we were inspecting last week. 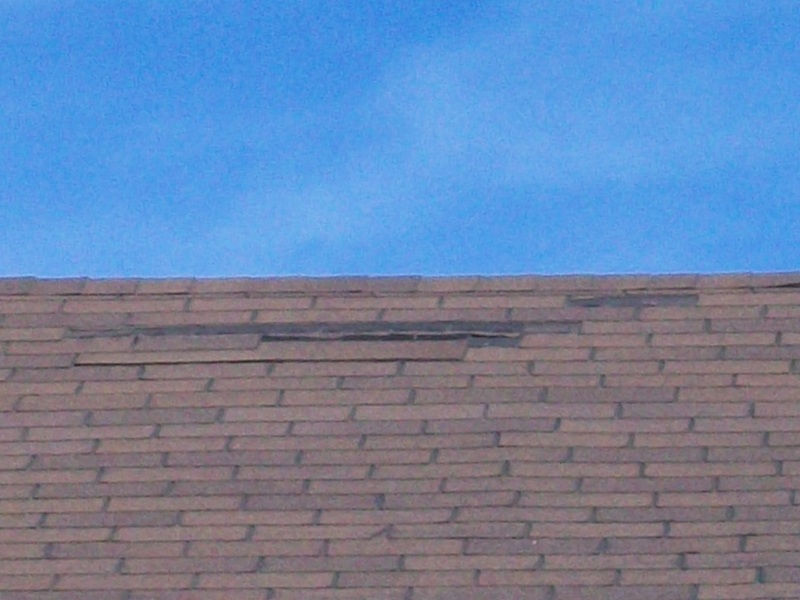 These are shingles which have been damaged by high winds. And there are storm damaged roofs all over the Metroplex. It’s not unusual, either. All it takes is a high fastener raising a shingle tab up so the wind can get under it. Maybe the roof was installed on a cold or damp day, and the shingle tabs never stuck like they were supposed to. Thunderstorms happen in various parts of the Metroplex on a fairly regular basis. Granted, we just passed through a pretty dry summer, but do you know if your roof suffered any damage when those rare storms came through? Do you have roof damage that you haven’t seen? Wind-damage to shingles doesn’t require a bad storm, either. Shingles can be easily damaged if they were not installed properly. Storms aren’t the only thing that can cause damage. Shingles can be easily damaged in high winds if they were installed incorrectly. Or other damage can occur while a roof is being replaced. 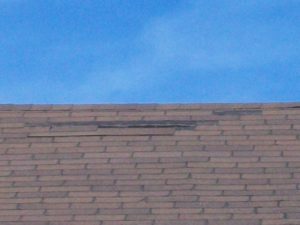 See the post in this section “Hazards Caused By New Roof Installation” about damage we found on an inspection, which had been caused by careless roofers. From now until December 15, 2011, House Exam Inspection offers a stand-alone Roof Inspection. We’ll come and examine your roof for $99.00. That’s $30 off our regular price. We’ll let you know exactly what the damage is, where it is and how to present a claim to your insurance company along with our letter. No more wondering. No more guessing. You will have the factual information for your peace of mind. So call to schedule a Roof Inspection, and get the Peace of Mind you are looking for.